Donald Trump has used a veto for the second time in his Presidency, blocking a bipartisan Congressional resolution to end US military intervention in Yemen. The GOP-majority Senate had passed the bill on March 13 in a 54-46 vote, with the House confirming the measure earlier this month. Each chamber will now have to support the resolution with a 2/3rds majority to override Trump’s veto. The war in Yemen began after an Arab Spring uprising in 2011 against President Ali Abdullah Saleh, who had ruled for 21 years. He was replaced in February 2012 by Vice President Abdrabbuh Mansour Hadi, but the new government faced challenges such as food insecurity, unemployment, and corruption. The Ansar Allah (Houthi) movement led an insurgency they had done against the previous regime, and were able to capture Saada Province in northern Yemen. The Houthi movement represented some of Yemen’s minority Shia Muslims, but Sunnis and other Yemenis, disillusioned with the post-Arab Spring transition, joined them. Crucially, Saleh — still hoping to regain office — also entered a tentative alliance. Iran’s purported backing of the Houthis, compared with the group’s takeover of the capital Sana’a, led Saudi Arabia and eight other Sunni-majority Arab states to begin a campaign of airstrikes, ground attacks, and blockades in March 2015. The coalition is also seeking to restore the Hadi Government throughout Yemen, and has received intelligence and arms support from the UK, US and France. The UN estimates more than 7,000 people have been killed since March 2015, with about 11,000 injured. The majority of those fatalities are thought to be civilians, with reports of attacks on hospitals and schools. Millions more are suffering from shortages of food and medical supplies. The US and UK have faced numerous calls to end their involvement in the conflict. 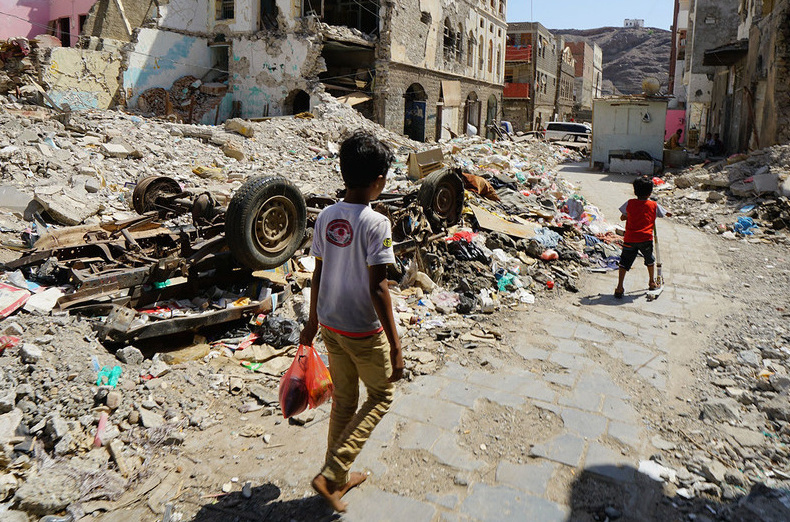 With the high numbers of civilians killed, displaced, and threatened by starvation and lack of healthcare, pressure to end arms sales to Saudi Arabia and other Arab states has increased. Many legislators — including some Republicans — are uneasy with Trump’s role in the conflict, given the close ties he and his family have with Saudi Arabia and the UAE. The assassination of journalist Jamal Khashoggi last October, reportedly ordered by Saudi Crown Prince Mohammad bin Salman, was a catalyst for the resolution to end intervention. In Stockholm in December, peace talks were brokered that included a ceasefire and prisoner exchanges. However, tight deadlines within the deal have not been met, and there has been a resumption of clashes and airstrikes. On Monday, UN Special Envoy Martin Griffiths said the rival factions have finally agreed on terms for a withdrawal of troops from the port city of Hodeidah, after months of talks. Cam Lindsay is the Project and Communications Officer for EA WorldView.